The NTSB found a few critical errors that lead to the incident and which impacted their investigation, including the Air Canada pilot’s failure to report the near-miss until the next morning, when the plane’s cabin recordings had already been recorded over after a different flight, via the Evening Standard. The pilot claimed he didn’t report immediately because he was “very tired.” The NTSB also found that there was only one air controller on duty, a second flight controller had just gone on a scheduled break, and criticized the FAA for not having more air controllers be on staff at all times to catch incidents like planes trying to land on taxiways. The report says the on-duty controller failed to provide direction. The report also indicates the pilots were confused by construction on the ground that had closed one of the parallel runways, and that the lighting had been changed for construction and made the runway less clear. The NTSB found that the airport had not conducted a hazard study of the new lighting arrangement. Preliminary notes from the NTSB a few months ago indicated the four planes in the taxiway had turned their bright taxiing lights off, making them harder to distinguish for the Air Canada flight crew. The report also claims the pilots were likely operating under some level of fatigue. After the incident, the FAA instructed pilots to conduct instrument landings when approaching San Francisco International instead of visual approach, according to ABC7. Some of the pilots on the ground turned on their lights to warn the incoming plane of their presence. Luckily, the pilots of the incoming flight initiated their go-around before they were ordered to do so by the flight controller, narrowly avoiding disaster. The NTSB board also criticized the industry’s self-reporting of incidents, claiming none of the pilots lined up on the taxiway, some of which were clearly aware of the near-miss, ever reported anything to prompt an intervention or investigation, according to Toronto City News. 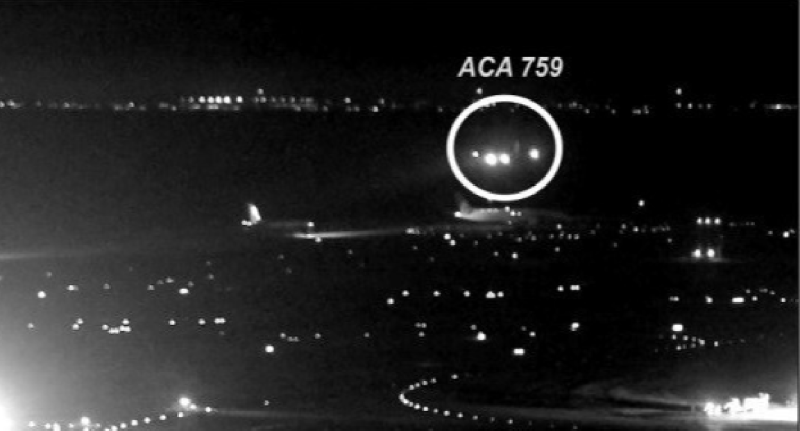 Air Canada has already taken steps to better familiarize its pilots with the San Francisco airport, and the NTSB has recommended the FAA conduct a study analyzing runway closures and implement ways of improving runway identification at night. It also determined the airport should have a minimum of two controllers on duty at all time. The current deadliest aviation disaster occurred in 1977 under similar circumstances, when KLM Flight 4805 taking off in a fog collided with Pan Am Flight 1736, which was still taxiing off on the runway in Tenerife, killing 583 people on both flights. Correction: The article has been updated to correct that KLM Flight 4805 was taking off, not landing, in the deadly crash in Tenerife.